The construction industry in Texas is booming. While the construction industry employs thousands of workers, it’s not without serious risks. Construction is inherently more dangerous than many other types of jobs. With no room for error, it’s crucial that construction companies do everything in their power to protect workers from terrible accidents. Unfortunately, this doesn’t always happen. According to the Occupational Safety and Health Administration (OSHA), construction accident fatalities accounted for 21% of all workplace fatalities in 2016. To put it more simply, one out of every five workplace fatalities is in the construction industry. Falls – Falls accounted for nearly 39% of construction accident deaths in 2016. Whether it’s falling from a height, falling from scaffolding, or slipping on a wet surface, falls are a major cause of construction accidents. Struck By Object – There are a variety of things that can strike a worker on a construction site, including machinery, tools, falling objects, and vehicles. Electrocutions – Electricians aren’t the only ones who face an electrocution risk. All construction workers face this risk because they work around live wires and electrical equipment. Caught-In or Between – Anytime a worker is caught-in or compressed by equipment, objects, machinery, materials, or collapsing structures, it is considered a caught-in or between accident. Construction companies have a responsibility to their workers to keep them reasonably safe from harm. For construction workers, one of the best ways to prevent accidents and injuries is by using safety equipment. Even the most basic safety gear, like hard hats, goggles, gloves, and steel-toed boots, can save lives. In addition to safety gear, workers also need plenty of safety training. Construction companies, like all employers, are required to provide all necessary training. This includes training not only on the tools, equipment, and procedures a worker will work with, but also training regarding any of the dangers a worker will be exposed to on the jobsite. 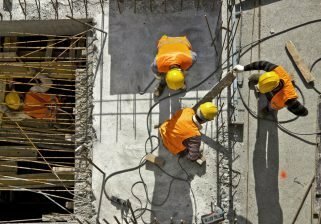 Many construction companies in Texas do not subscribe to the workers’ compensation system, meaning construction accident victims are often left with hefty medical bills and other financial burdens. If you or someone you love was injured in a Corpus Christi construction accident, don’t wait to call Sahadi Legal Group. We can fight for the compensation you need and deserve. Call us today to schedule a free consultation.